Happy Happy New Year, my dear Kitchen Operas readers! How lovely it has been to spend time with family, friends, and relaxing over the holidays — I hope you all had wonderful celebrations as well. Mr. KitchenOperas and I hosted dinner for 17 (!!!) on Christmas Eve, and had such a lovely time with everyone. And the kitchen is finally back to its normal state! I also had several food adventures with dear friends (including eating my first dhokla with Pem, making my first wedding cake with Francesca, and eating all the cotton candy before singing with Ashley); I can’t wait for more delicious times in 2015! With the new year comes new resolutions, and I’m working on cooking more at home… we tend to eat out or order in a lot when we get busy, and forget about all the delicious things we can make ourselves. So to start the year off right, I’ve got a pot of lentils on the stove (stay tuned!) and I just took this roasted squash out of the oven. My inspiration comes from one of my favourite cookbooks — Plenty by Yotam Ottolenghi. (He’s also got a new book out, Plenty More, which I think is coming home from the local bookstore with me this weekend!) In Ottolenghi’s version, Roasted Butternut Squash with Sweet Spices, Lime, and Green Chile, he roasts butternut squash with ground cardamom and allspice, and tops with a tahini dressing, salted slices of lime, fresh cilantro, and green chiles. I’ve made a version with the groceries we had in the house — a sweet Kabocha squash, a Meyer lemon, the tahini dressing, and some pumpkin seeds! And ohhhhh it’s pretty tasty. 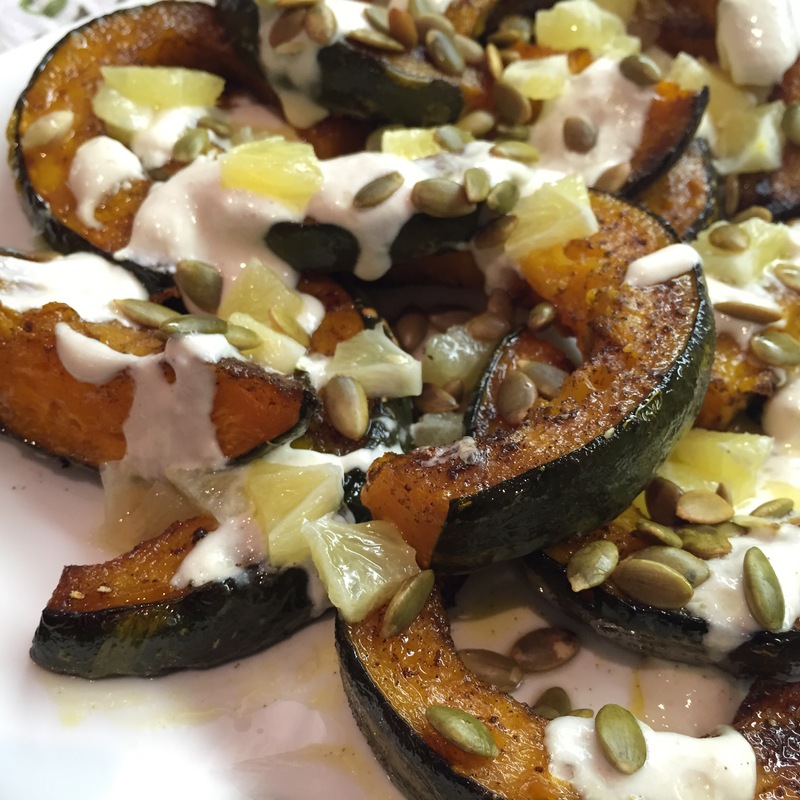 I am loving the sweetness of the cardamom-flavoured squash along with the creaminess of the tahini dressing and the tartness of the lemons! This recipe makes about twice as much tahini dressing as you’ll need. I’ve got my leftovers in the fridge, waiting to go over a spinach salad. You can serve this as a salad before the meal or a side dish accompanying the meal; the acidity from the lemon makes it feel like a salad with a vinaigrette over top. We’re having it today alongside spiced lentils and volcano rice — I’m putting everything together on one plate and enjoying our feast! If this is a sign of delicious things to come for the new year, I think it’s going to be a pretty wonderful 2015! Meyer lemons are sweeter than regular lemons, and have a stronger lemony smell. If you don’t have Meyer lemons, feel free to use regular lemons or limes here. 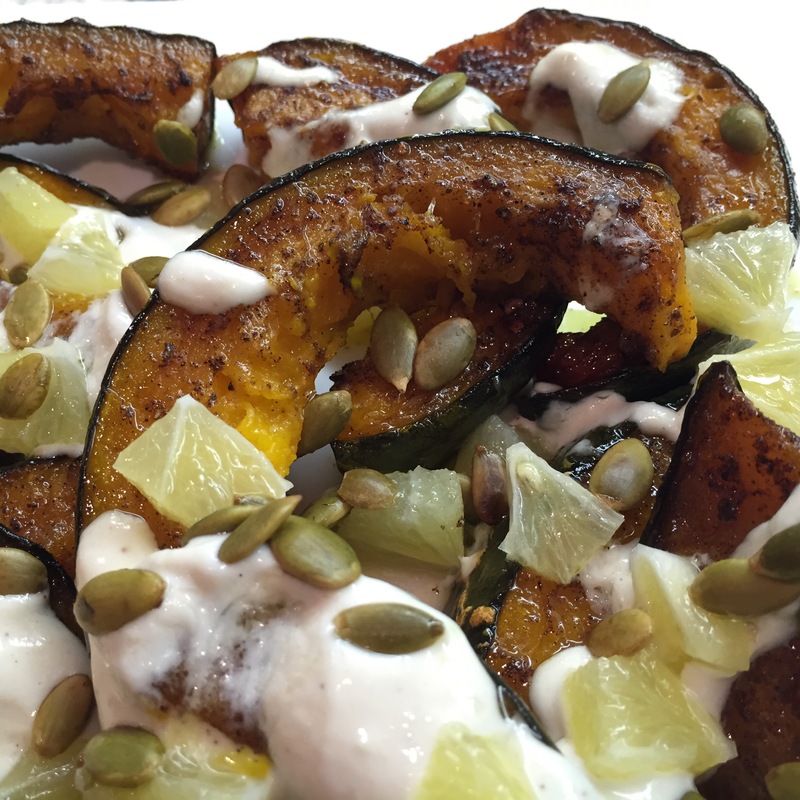 You’ll end up with extra tahini sauce, which you can serve alongside the platter of squash, or save for later. Inspired by “Roasted Butternut Squash with Sweet Spices, Lime, and Green Chile” from Plenty by Yotam Ottolenghi, Serves 4-6 as a salad or side dish. Cut slices off the top and bottom of the Meyer lemon, and stand up on its end on a board. Slice down the sides of the lemon to remove the skin. Quarter the limes lengthwise, then thinly slice each quarter. Place these lemon slices in a bowl, along with 1 Tablespoon of the olive oil, and the sea salt. Set aside for garnishing the squash. Using a mortar and pestle, crush the cardamom pods to remove the seeds, discarding the pods. Crush into a rough powder. In a small bowl, mix the crushed cardamom seeds with the ground allspice and the remaining 3 Tablespoons of olive oil. Use a pastry brush to brush this oil over the sliced squash. Roast for 15-20 minutes at 400F, until fork-tender. Remove from oven and let cool. 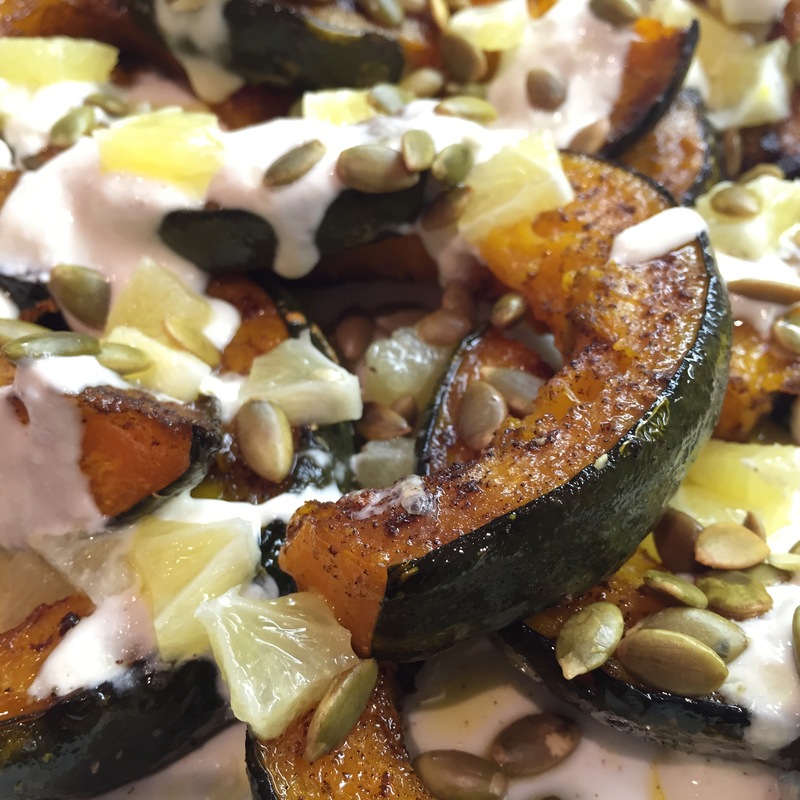 While the squash is roasting, whisk together the Greek yogurt, tahini, and Meyer lemon juice along with a pinch of salt. The tahini sauce should be pourable — add 2-3 Tablespoons of water to thin it out (and add more water if necessary). 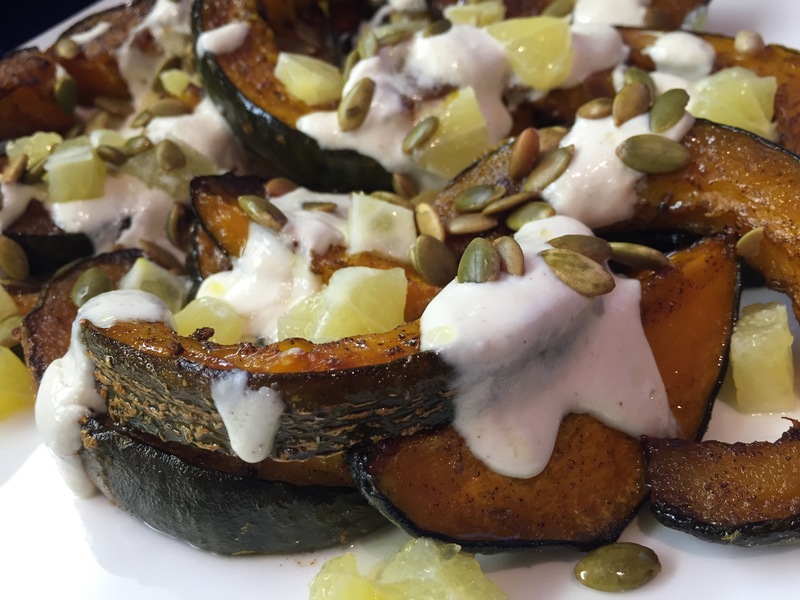 When ready to serve: place the squash slices on a platter and drizzle with half of the tahini sauce, pour the lemon slices and their juices over top, and sprinkle with the pumpkin seeds. Enjoy!